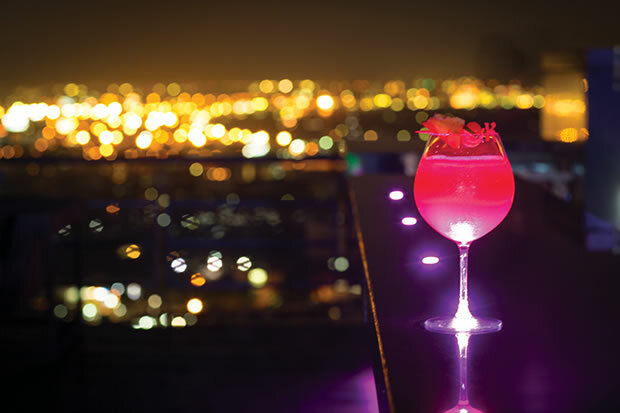 Come enjoy candy-pink cocktails and white chocolate margarita with a 360-degree view at Anantara newest bar. The night below is a hectic blur of rushing traffic and bustling activity. But 40 floors above it all at Zoom Sky Bar and Restaurant, the newest addition to the Anantara Bangkok providing an unobstructed 360-degree view of the skyline, the vibe is open and free, and the night is decidedly whatever you make of it. After you make an ear-popping ascent in the elevator and round the neon lighted steps, the venue’s large, elevated bar comes into view as the focal point. Unlike other sky bars where it may be necessary to order a full dinner in order to fully enjoy the space, at Zoom, the open layout and ample seating around the bar mean that here, spirits reign supreme. I plunked down on one of the cushioned seats flanking the bar and decided on “Paradise on Earth,” one of the specialty cocktails going for THB 375. The cotton candy–pink cocktail, deliciously presented with a pineapple and Marciano cherry skewer on top, is a mixture of brandy, banana liqueur, apricot brandy, lemon juice, and grenadine. The first sip tasted like a vacation in Koh Samui. Equal parts sweet and tangy, the drink was delightfully refreshing and dangerously good; three sips in I couldn’t taste the alcohol, but I did start to feel a warm and pleasant buzz. Another of the handcrafted specialty cocktails is the white chocolate margarita, made of house-infused white chocolate Maguey’s tequila, cinnamon and honey. This drink is unlike anything I have ever tasted: the first sip was tart and tangy, sending a shiver down my spine, but a millisecond later, the drink followed up with a sweetness that had me licking my lips and reaching for another sip. “The concept of Zoom is trendy and flirty, but can also be romantic. We wanted to keep the vibe open and unrestricted,” explains general manager, Naowarat Arunkong. Forty different colored mood lights that change throughout the evening, and female DJs spinning nightly and catering to the mood of the guests cultivate the free-spirit ambiance. Every other Wednesday, the sky bar will also feature a live saxophonist, lending a romantic air to the elegant space. Naowarat explains the name Zoom was conceived because patrons can either “zoom in” and focus on conversation with good friends or “zoom out” and enjoy the view of the night sky or the sparkling skyline. Either by the bar or half flight of stairs down from it to the tighter and more intimate area of couches and loveseats overlooking the Chao Phraya, Zoom is definitely worth checking out and experiencing feeling infinite, as if the whole world below were yours for a night.